Industrial safety footwear is a very important piece of equipment for anyone working in an industrial environment. No matter how careful you are, accidents happen. You may drop something or accidentally step on a sharp object. This could put you out of work for several weeks, not to mention all of the pain you will suffer. Since much of your day will be spent on your feet, it is very important to keep your feet safe and comfortable. Safety shoes are designed for both safety and comfort. Some are more comfortable than others. Some are more fashionable than others, as well. As long as the shoes or boots you choose meet with the safety standards of your job, you can usually choose the style you prefer. As an electrician, or electrician’s apprentice, you know that electricity must have a complete circuit to continue its flow. Without the proper footwear, you may be the ground the circuit needs to complete this flow. When electricity does not have a point of entry and a point of exit, then you do not have to worry about an electric shock. This is why a bird can comfortably sit on a high voltage power line without risk of shock. The bird only has contact with the circuit at one point. Even though both feet are touching the wire, they are touching it at the same point, which means there is no current flowing through the bird’s body. If you could float up to the wire and grab on, you would not get a shock either. But, since when you do get up there you are usually on a ladder or in an aerial basket, you are completing the circuit by being in contact with something other than just the wire. Now, you are probably thinking that you will not be barefoot when you are touching the wire. Your rubber-soled shoes are insulators, so you should be safe, right? Rubber-soled shoes do provide some insulation from electrical shock. However, the average shoes are not designed to be electrically safe. The soles are simply too thin and the rubber is not up to electrical safety grade standards. In addition to this, the shoes may have dirt, moisture or body sweat on them. This further compromises any insulating properties they may have had. Normal footwear is just not adequate protection when working with high voltage. 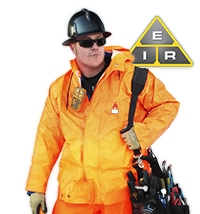 Industrial safety footwear comes in all sorts of styles and fashions. They are also graded for different types of industry. Safety boots are durable boots or shoes reinforced with a protective steel toe that protects your foot from falling objects or from being crushed. The boots usually have a solid mid-plate that protects the soles of your feet from punctures in case you step on a nail or other sharp object. Traditionally, the reinforcements are made of steel, but these days they may be made of composite materials, thermoplastic polyurethane or aluminum. Wearing safety boots is mandatory in most factories and on construction sites. Since electricians are required to work at various locations, they must wear electrical grade safety boots whenever they are on the job. In most jurisdictions, these boots must be fully certified, and display the certification right on the side of the boot. Industrial safety footwear comes in all sorts of cool designs, including running shoes and clogs. You can even get safety shoes that look like dress shoes. 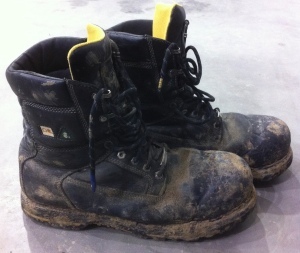 These are mostly worn by supervising engineers that have to visit construction sites, or oversee certain projects where safety shoes are mandatory. High fashion designers, such as Grinders and Dr. Martens have also jumped on the safety shoe bandwagon. Many of their safety shoes have gained a cult following amongst the younger crowd. Green triangle – Class 1 toe protection and sole protection. Suitable for heavy industry such as machine shops and construction sites. Yellow triangle – Class 2 toe protection and sole protection. Graded for light industry. White square with the ohm symbol inside – this is the electrician’s safety boot. The sole provides resistance to electric shock. These are used anywhere live electrical conductivity may occur. Red triangle with a black C and grounding symbol – the soles are electrically conductive. 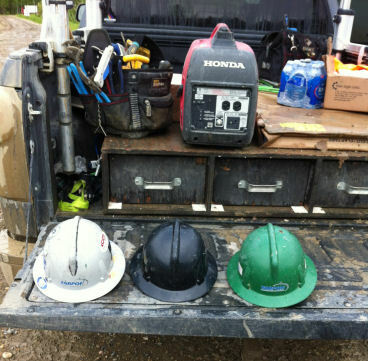 These are used in industrial environments where low electrical charges may present a hazard to workers or equipment. Fir tree or white label with a symbol of fir tree inside – used by forestry workers and others who use chainsaws. Blue square – Class 1 toe protection only. 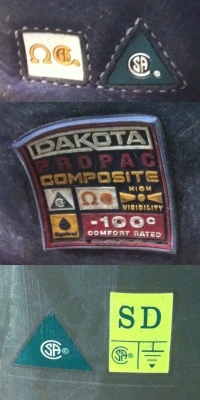 Used in environments other than the ones listed above. For most factory workers, industrial safety footwear with a classification of green, yellow or blue are all the protection they need. Electricians, however should always wear the white grade with the ohm symbol. These shoes will reduce the risk of electrical shock, and quite possibly save your life. You will never intentionally put yourself in danger or grab a live wire, but accidents happen. 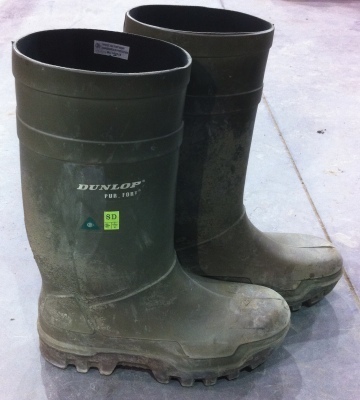 Why not take the extra precaution and wear the proper footwear for your job? 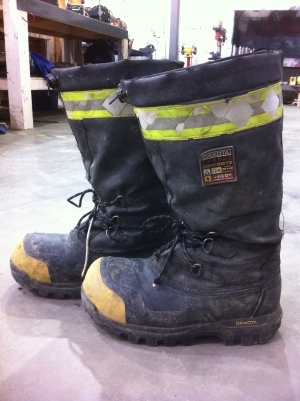 Industrial safety footwear is expensive, but if it can save you life. It is worth the cost.